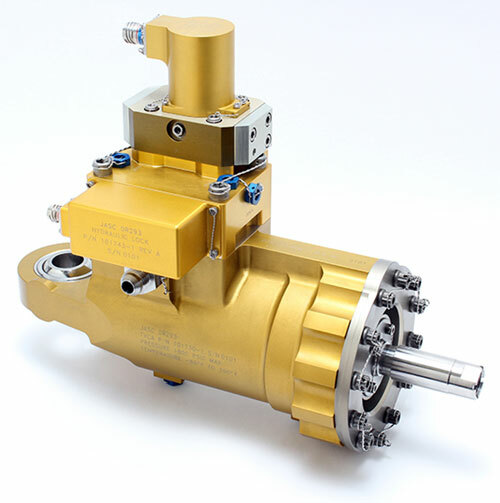 The 101730 Hydraulic Servo-Actuator continues JASC’s legacy of Thrust Vector Control Actuators for the space industry. This actuator incorporates a fully passive hydraulic locking device that secures the actuator in any position when supply pressure is removed—thus locking the engine in place during captive carry. It delivers 15,800 lbs. of static force at 1500 psid and exhibits excellent frequency response (10.1 Hz @ -3 dB). Each section is fully modular, so the locking mechanism can easily be removed if not required. This unit features JASC’s patented FlexJet® Electro-Hydraulic Servo Valve, which provides a more robust alternative to more traditional jetpipe designs. This servo is designed for high contamination tolerance and long life—even in the most severe shock and vibration environments generated by these engines. The TVCA incorporates full-open indication of the hydraulic lock and analog reporting of actuator position via an internally-mounted, temperature-compensated LVDT. Multiple layers of integral filtration guarantee sustained mission performance, making it suitable for use in fueldraulic systems as well. The entire assembly weighs less than 20 lbs.